Alright, so it is summer and your kids are always on your phone/their phone/your iPad/their iPad. Let’s be honest here. If they’re going to be on the screen, you may as well have them do something educational with Orphs of the Woodlands at Tangletree from Star Toaster. The app is only $1.99 at the iTunes store, which I know because I didn’t use my promo code in time for this review so I ended up paying for it. However, it’s a great concept, and I’ll tell you why. First of all, Orphs of the Woodlands is designed to teach reading comprehension and language arts concepts. 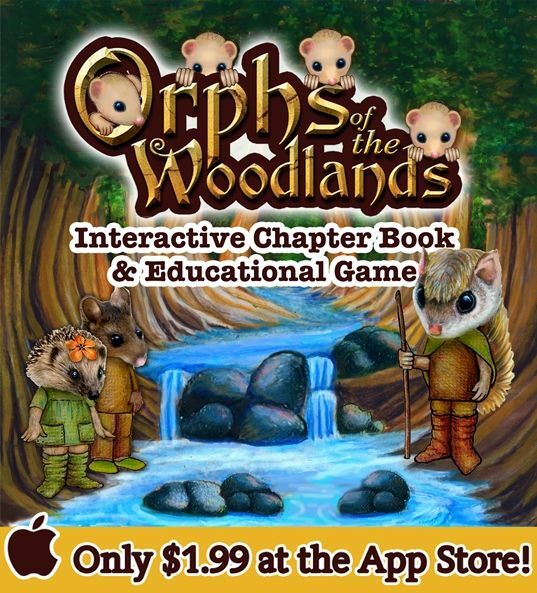 They encourage your child by rewarding them for reading with games which earn them points they can use to purchase items for their woodland orphans. One thing that’s really smart about the structure of this game is that your child CANNOT do any “jobs” (this is how they earn stars) until they unlock them by reading a chapter of the interactive chapter book. That means they absolutely have to do a little reading in order to get to purchase items they want to get. In chapter one, you see halfway is a link. 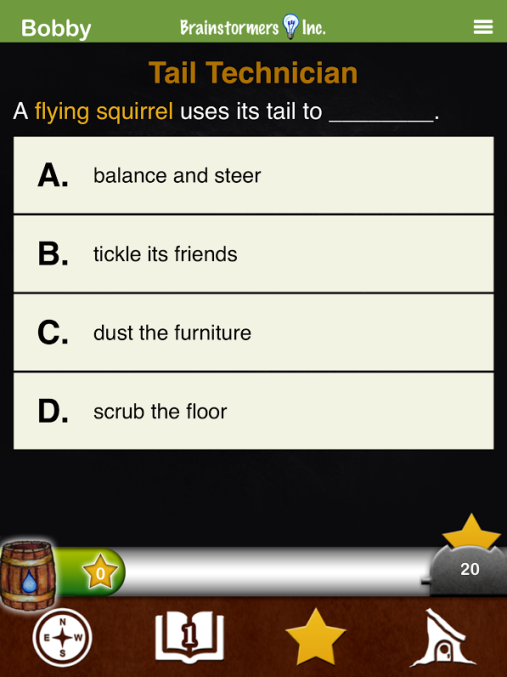 If your child clicks on it, it takes them over to an explanation of compound words and gives them several examples. When they go over to earn stars, one of the jobs will involve being able to fill in the blanks on compound words to complete them correctly. There are also comprehension jobs that relate to additional information provided on concepts, such as a “weather predictor” or “tail technician”. Some of these reading comprehension extensions are actually read to your child when the click on the link, which is nice especially if it is science-heavy. Generally speaking, we really like this interactive book and game. My daughter is happy to play it, and I don’t feel guilty handing over my phone when there’s reading involved. We do have a couple of things we didn’t like, however. Looking at the screen above, you’ll notice that when there’s a “letter” or “journal” the type can be VERY small. My daughter didn’t like that and thought it made it hard to read. Also, some of the name choices in the story are questionable for less confident readers- such as Hattah and Eixie. My daughter really struggled with that one- “The E says its name, right mom, because it’s two vowels? But that’s a strange name.” Now obviously that small type would be fixed by being on an iPad screen, and when she plays on the iPad we don’t have that issue, but we don’t really take our iPad to go the way we take our iPhone, so that was a downside for me. The only other issue we had is specific to my daughter who still likes to track with her finger when she reads- not ideal for on-screen reading, but that’s a problem we have on lots of programs and devices, and hopefully as she becomes a more confident reader this will stop being a problem. Luckily on this program, you actually have to click on the arrows to change the page, so she isn’t swiping the pages away trying to read, but she did have a tendency to click on more information links when she didn’t mean to. Overall, Savannah liked this product a lot and is happy to read and play on my phone, so I’d give it a thumbs up the next time you need to purchase a few moments of sanity while you wait in line, at the DMV, at sports practice, or any of the 1,000,000 other places we all end up putting our kids in a boredom holding pattern! Happy playing!